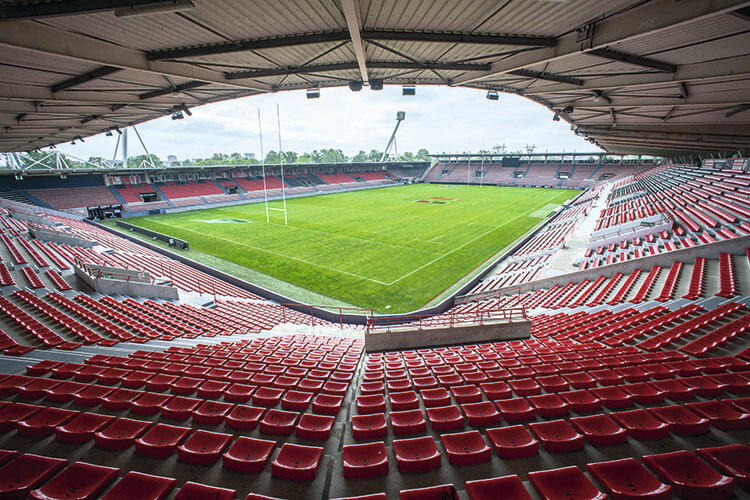 Situated in the heart of a region of rugby, the 19,500-capacity Stade Ernest-Wallon in Toulouse, is home to the famous Stade Toulousain French Rugby Union team. With 19 titles under its belt and many high-profile players, the Stade Toulousain is the most prominent rugby club in France. To keep up with its international standing, the Stade Toulousain recently underwent a complete technical upgrade for its stadium. With the passing of time, new security / evacuation standards, such as EN54-24, had been introduced and digital signal transport protocols streamlined with the introduction of Dante by Audinate. The club approached local audio visual installation company, Triaxe, with whom it had worked previously for a screen solution deployment, and the integration company sought out the best solution for the best value. The decision was for an advanced Powersoft Ottocanali system to power a D.A.S. stadium loudspeaker system. The problems at the Stade Ernest-Wallon had begun last season when some of its existing amplifiers started to fail on several stands. Losing channels during a Second Division rugby match was something that needed fixing before the new season started, and a break for a month in September offered the perfect opportunity. Meanwhile Christophe Carles, Technical Director of Axente, which distributes both Powersoft and D.A.S. Audio, first modelled the stadium using EASE predictive and visualisation software. Working with Axente, Triaxe designed a cost-effective and economic PA system in which five of Powersoft’s increasingly popular eight-channel Ottocanali 8K4 drive 76 D.A.S. Audio WR8826 DX IP65-rated 80° by 80° dispersion loudspeakers. The Ottocanali 8K4 outputs 1,000W per channel into four ohms (and the sound is processed through D.A.S. Audio’s DSP-2060A processing. Housing two six-inch drivers, the loudspeakers are hung in clusters of two – one enclosure pointing back at the upper tier and the other for the lower stand. These are mounted around the lip of the stadium roofs, while in both corners of the C-shaped stands, there is an additional cluster of three loudspeakers. Axente recommended D.A.S. Audio WR8826 DX loudspeakers because of their power to size ratio. In addition, the speakers are rated IP55, making it perfect for outdoor use. The sound was zoned using a pair of Yamaha matrix devices, which managed the routing over several protocols including Dante. Aside from delivering great intelligibility to the crowds, the team at Stade Ernest-Wallon also wanted to put the players ‘in the zone’ as they emerged from the tunnel onto the pitch providing high SPL to help motivate them to the atmosphere – and this clever piece of psycho-acoustics is certainly one of the prime features. Pierre Carrère, co-owner of Triaxe said: “The choice of Powersoft was an easy one. Ottocanali is dedicated to the installation market, and having eight channels allows you to save space and save power while the audio quality speaks for itself. This was important because the technical rooms are quite small.” Triaxe also new that by standardising on Powersoft it could achieve a homogeneous and coherent solution.